Samples of fish and surface water from Primrose Lake were taken to investigate concerns about the “muddy” taste and soft texture of fish harvested from the lake. Traditional foods are an important part of many First Nation communities because they are often more readily available, healthier and less expensive than store-bought convenience items. Also, their harvesting and consumption is important from a nutritional, social and cultural perspective. Given the harvesting of fish from local lakes by many First Nation communities, and as a frequently consumed food, the health risks of increasing contaminant levels in fish are of greater concern than in the broader Canadian population. The proximity and potential impact of both oil and gas development and military activities to the traditional territories of Cold Lake First Nations (CLFN) has resulted in a sense of uncertainty and a lack of confidence in the quality of traditional foods. In Cold Lake, Alberta, members of CLFN have expressed concerns regarding the “muddy” taste and soft texture of fish harvested from Primrose Lake. It is located within the Department of National Defence Cold Lake Air Weapons Range and the CLFN territory. Community members have expressed concerns about the potential impacts of anthropogenic activities on the quality of the surface water and, in turn, the quality of the fish caught from the lake. Intrinsik Corp. and CLFN partnered to investigate the community’s concerns. 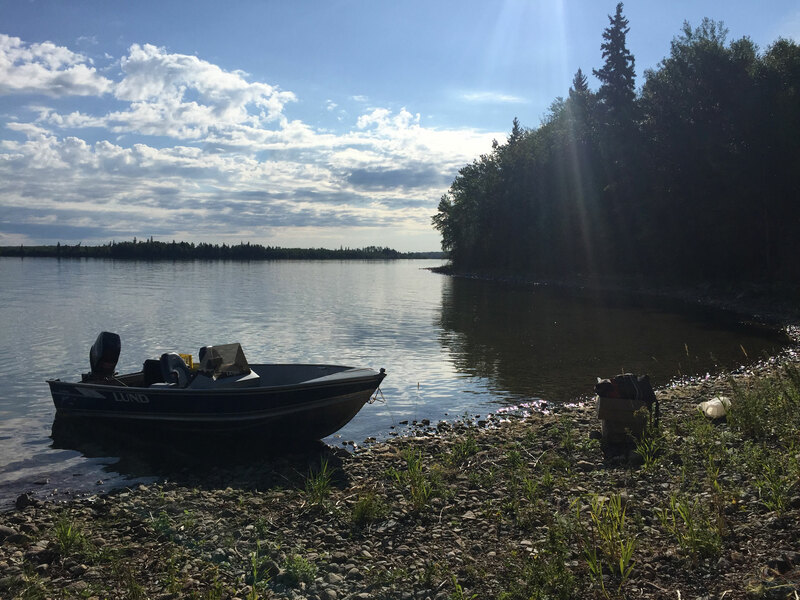 In the summer of 2016 and winter of 2017, samples of fish and surface water from Primrose Lake were collected and a human health risk assessment was completed. The study was funded by Health Canada’s First Nations Environmental Contaminants Program. CLFN members, including youth and elders, were engaged in the study from its inception and provided community use and consumption details. Members were trained in sample collection and were involved in harvesting fish and collecting surface water samples for the study. To address the community’s concerns regarding potential impacts to water quality from anthropogenic activities, surface water samples were collected from the areas of Primrose Lake frequently used by CLFN members. Surface water samples were analyzed for typical water quality parameters, including metals, major ions and pH, in addition to petroleum hydrocarbons (PHCs), energetic compounds (i.e., explosives) and “taste and odour” compounds. Cyanobacteria and actinomycetes can naturally produce geosmin and 2-methylisoborneol (MIB) compounds that can subsequently accumulate in benthopelagic fish. Benthopelagic fish live and feed near the bottom as well as in midwaters or near the surface of water bodies. When there are algae blooms such as blue-green and other algae in the lake, both the fish and the water will have increased concentrations of geosmin and MIB. Lake whitefish, in which CLFN members reported a “muddy” taste, have higher levels of exposure to the bacteria than other fish, due to being benthopelagic. When cyanobacteria are metabolized by the fish, residual compounds are left in the tissues which can cause an “off” or “musty” flavour. These residual metabolite compounds, including geosmin and MIB, are at their highest levels in the fish tissue during the summer and early fall, coincident with the warmer temperatures and lower lake levels that are conducive to algal growth. Geosmin concentrations in the lake water can have considerable seasonal variation. To account for this, the study was designed to capture different seasonal concentrations through the collection of water samples in both summer and winter. Three water samples were obtained in the summer of 2016 (August) and another three were collected in the winter of 2017 (January and February). Approximately six litres of water were collected for each surface water sample. Following collection, the samples were stored to maintain temperature and submitted for analysis to ALS Environmental, a Canadian Association for Laboratory Accreditation laboratory located in Edmonton, Alberta. Benzene, toluene, ethylbenzene and xylenes (BTEX) and PHCs were analyzed according to methods modified from those developed by the United States Environmental Protection Agency (US EPA) and the Canadian Council of Ministers of the Environment (CCME). Specifically, BTEX and F1 PHCs were quantified using gas chromatography/mass spectrometry (GC/MS) according to methods EPA 8260C/5021A and CWS PHC Tier 1, while gas chromatography/flame ionization detection (GC/FID) was used for F2-F4 PHCs according to methods EPA 3511 / CCME PHC CWS GC-FID. Polycyclic aromatic hydrocarbons (PAHs) were analyzed by GC/MS according to US EPA methods EPA 3511 / EPA 8270D GCMS. Metals were analyzed by collision/reaction cell inductively coupled plasma mass spectrometry (CRC ICPMS) according to modified US EPA method EPA 200.2/6020A as well as EPA 1631E (mercury) and APHA 3500-Cr C (hexavalent chromium). The energetic (explosive) compounds were analyzed by high-performance liquid chromatography (HPLC) with UV detection according to US EPA method SW846 8330A. Geosmin and other taste and odour compounds were analyzed by gas chromatography/high-resolution mass spectrometry (GC/HRMS), using an in-house method developed by ALS Environmental. No PHCs, BTEX, nor any PAHs were detected in any of the water samples. The detection limit for the F1 and F2 PHC fractions was 0.1 mg/L. Detection limits for benzene, toluene and ethylbenzene were 0.0005 mg/L, and 0.00071 mg/L for xylenes. For PAHs, detection limits ranged from 0.000005 mg/L to 0.00005 mg/L. There were no energetic compounds detected above their limits, which ranged from 0.25 μg/L to 0.50 μg/L. Metals were detected in the summer and winter water samples at similar levels. Additionally, major ions were detected but were not carried forward in the assessment of surface water on the basis that they are either essential nutrients or are considered non-toxic to humans. Geosmin was detected in all three summer water samples, at levels ranging from 12.9 ng/L to 18.5 ng/L. However, in the winter water samples, geosmin was not detected above its detection limit of 1.0 ng/L. MIB was not detected above its detection limit of 10 ng/L in any of the water samples. Additionally, none of the other odorous chemicals were detected in any of the water samples. The measured concentrations of metals that were detected in surface water were compared to the human health-based Guidelines for Canadian Drinking Water Quality, published by Health Canada. They were below these guidelines and the measured pH values were within the range of acceptable values. Adverse effects to human health are not expected to occur from exposure to a chemical in drinking water at levels below the drinking water guideline. Although the analytical results identified that the Primrose Lake surface water was within the range of acceptable values, these results are counter to the beliefs and traditional knowledge of many members of CLFN because of the proximity of anthropogenic activities to the Lake and the historical uses of the area. For those chemicals that were detected in surface water but that did not have drinking water guidelines available from Health Canada, drinking water guidelines were calculated by Intrinsik, consistent with risk-based toxicological values and equations used by Health Canada in calculating their drinking water guidelines. None of the measured concentrations exceed the risk-based toxicological values. Geosmin has a very low taste and odour threshold, such that the human nose and palate can detect its presence in water at very low concentrations of parts per billion. Measured concentrations of geosmin in all three summer water samples were above the taste threshold of 5 ng/L, and one summer water sample was above the odour threshold of 15 ng/L. Geosmin was detected only in the summer samples. While geosmin is not toxic to humans, it can impact water and fish, imparting a strong “earthy” and unpalatable “musty” odour and taste. Given that geosmin was detected at levels above the taste and odour thresholds in summer water samples, and it is known to impact the flavour of fish in a manner that is consistent with the anecdotal reports by CLFN members, the unpalatable taste of fish harvested from Primrose Lake in the summer months may be linked to the presence of geosmin. This fact is of interest given that indigenous people are particularly vulnerable to the impacts of climate change and often have the longest ecological record of past conditions contained within the oral history of their communities. Tainting of fish taste, as a result of geosmin in the fish muscle tissue, may provide a qualitative measure of the metabolic byproducts of algae blooms that will have a direct impact on the diets of First Nations peoples, as the influence of climate change on lakes increases (and associated algal blooms) with increasing water temperatures. The surface water at Primrose Lake was not evaluated for microbiological parameters such as E.coli, coliforms, bacteria and viruses. Therefore, the quality of the untreated surface water with respect to these parameters is not known. Measured water quality from the study with respect to the levels of PHCs, BTEX, PAHs, metals, energetic compounds, geosmin and MIB is not expected to result in adverse effects to human health. There are no health risks anticipated from the consumption of fish that have an unpalatable taste due to geosmin. Claire McAuley, MSc, M.Eng., P.Eng. and Nino Devdariani, MEnvSc, are with Intrinsik Corp. Findley MacDermid, MSc, is with Cold Lake First Nations Consultation Department. This article appears in ES&E Magazine’s February 2018 issue.